And so, the paradoxical quest to find a man who is somehow both a) willing to get on national TV and voice his aggressive support for Donald Trump, and b), not plagued by some form of TV-toxic racist or sexist scandal just waiting to emerge resumes yet again today. 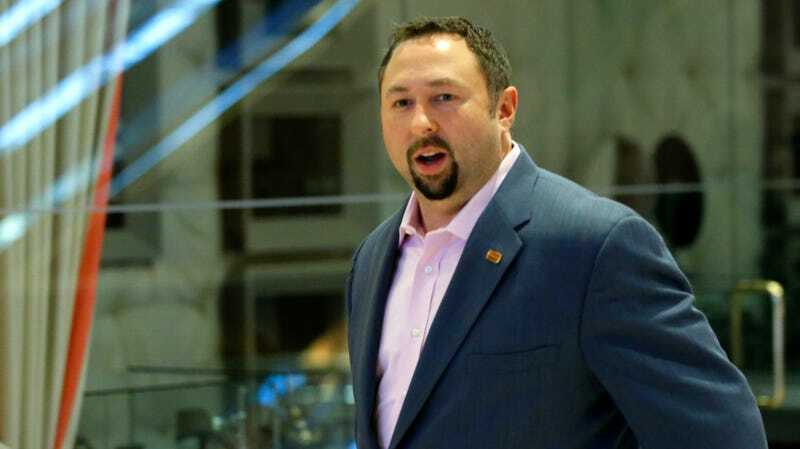 CNN has parted ways with contributor Jason Miller, the former communications director for the Trump campaign. Our sister site Splinter broke the story, and the court documents containing the allegations against him include some extremely unpleasant and disturbing stuff. Miller is currently in the middle of what sounds like a very ugly custody battle with another former member of the campaign, who accused him of dosing a second woman with “an abortion pill without her knowledge” during their relationship. Miller has denied the accusations, but says he’s now leaving CNN in order to “focus on clearing my name and fighting the false and defamatory accusations being made against me.” CNN confirmed his departure, but didn’t note whether it was as voluntary as Miller was making it sound. In fact, it’s almost like there’s something inherent to identifying wholeheartedly with Donald Trump that makes men extra-prone to receiving allegations of harassing, harmful, rude, and sometimes criminal behavior.